In 1999, a shooting at Columbine High School that resulted in the deaths of 12 students and one teacher left the country reeling, propelling campus safety into the national spotlight. Since then, incidents of violence have continued and school security measures have been examined and enhanced across the nation. Cpl. 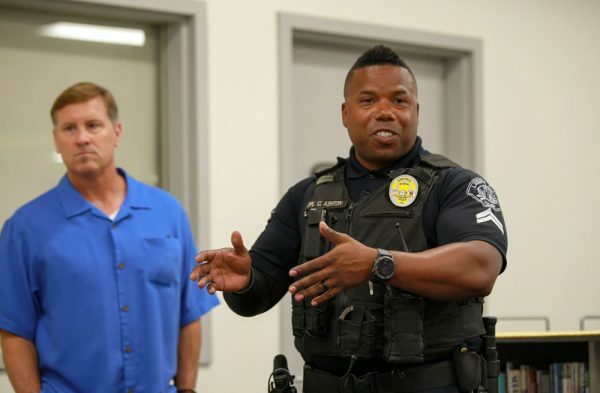 Cornelius Ashton, the newly appointed SRO for LBUSD, and El Morro Principal Chris Duddy, participate in an active shooter exercise on Aug. 1. Photo courtesy of LBUSD. On Aug. 3, Laguna Beach Unified School District filed its response to the report, enumerating the ways that LBUSD has prioritized school safety and security. The district stated that, as a result of regular internal and external evaluations, it has taken numerous steps to create a safe environment for students and faculty. According to assistant superintendent Leisa Winston, the district has a Safety Committee composed of classified, certified, and management staff along with parents and personnel from the Laguna Beach Police Department. This committee meets quarterly to review safety plans and make recommendations. In addition, the district has applied for an assessment by the Orange County Intelligence Assessment Center. This assessment is expected to occur in the fall, Winston said. Thurston Middle School Principal Jenny Salberg and Top of the World Elementary Principal Michael Conlon participate in an active shooter exercise on Aug. 1. Photo courtesy of LBUSD. Winston went on to explain that a district-wide emergency drill is held every year, with additional safety drills occurring at each school site. For drills and actual threats, the district’s Grand Jury response states that two-way radio devices should be used at all times “by custodial, supervisory personnel, playground supervisors, and athletics to communicate at all times with the office.” In addition, a designated emergency radio channel provides open communication between all sites. On Aug. 8, the district took another step to assess its emergency readiness. The LBUSD management team met with the Laguna Beach Police Department for an active shooter tabletop exercise, according to LBPD emergency operations coordinator Jordan Villwock. Villwock said that nine members of the department, including Chief of Police Laura Farinella, met with LBUSD administrators for a “discussion-based exercise which involved a realistic scenario.” Villwock said the exercise had three modules: suspicious activity on campus, initial response to an active shooter incident, and incident and recovery operations. He said the process allowed officials to examine policies and procedures and discuss each agency’s priorities. 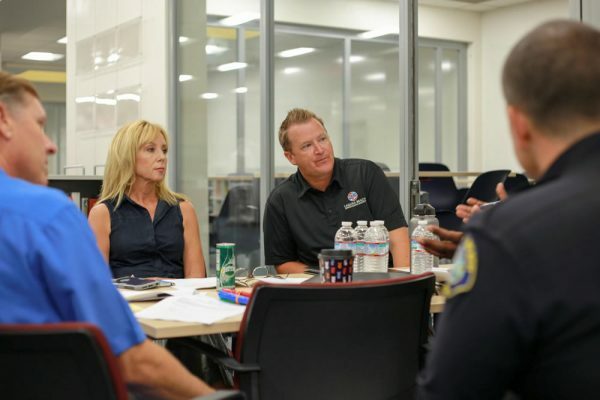 During the Aug. 21 board meeting, the district also voted to approve a Memorandum of Understanding to allow for a School Resource Officer (SRO) on LBUSD campuses. Cpl. Cornelius Ashton, an 18-year veteran of law enforcement with 15 years at the San Diego Community School District, was chosen to fill the role. Among other community benefits, LBPD Capt. Jeff Calvert said Ashton’s presence will enhance school security. Over the past few years, LBUSD has worked to make its physical spaces safer—Winston noted additions such as fencing updates, security cameras at each site, and intensive volunteer screening. In September 2017, all four Laguna schools began using the Raptor visitor management system, which scans driver’s licenses and prints visitor passes with ID photos on them. Winston said staff members have worn ID badges for years, and since last fall, substitute employees and Tier II volunteers have also worn identification badges on campus. Villwock said LBPD and LBUSD will continue to work closely together to support and protect Laguna youth. So — no students involved in planning?